When Republicans in red states wanted to reverse President Obama’s Deferred Action for Childhood Arrivals (DACA) program so they could deport innocent children of undocumented immigrants, they let the state of Texas take the lead in a case of forum shopping for a conservative activist judge who lets his political views color his judicial decisions. Texas had judge Andrew S. Hanen of the Federal District Court in Houston, the perfect fit. This is the same Texas judge that Texas and other red states used in 2015 to block a similar executive order by President Obama that would have added protections for the undocumented parents of citizens and other lawful residents (DAPA). So the State of Texas and eight other states filed a separate lawsuit seeking to declare the DACA program illegal and seeking an injunction to stop it. Judge Hanen gave the GOP plaintiffs what they asked for with the DAPA program, so surely he would give them what they wanted with the DACA program, right? Well surprise, surprise, surprise. Judge Hanen, his judgment no doubt colored by the recent spectacle of the Trump administration’s family separation policy and images of innocent children being abused and caged like animals, said no – as have all the other federal courts that have ruled on the DACA program. (Since there is now not a split among the circuits, as anticipated, this case is not ripe for review by the Supreme Court). A federal judge in Texas declined on Friday to halt an Obama-era program that protects young undocumented immigrants from deportation, handing a temporary victory to activists who are waging a legal fight against the Trump administration to save it. The judge, Andrew S. Hanen of the Federal District Court in Houston, said the program, known as Deferred Action for Childhood Arrivals, had been relied upon by hundreds of thousands of immigrants since it was established almost six years ago, and should not be abruptly ended. The ruling means that young immigrants who were brought illegally to the United States as small children can continue to apply for the program, which shields them from immediate deportation and provides a permit to work legally in the United States. The Texas judge, who in 2015 blocked a similar effort by Mr. Obama that would have added protections for the undocumented parents of citizens and other lawful residents, compared the idea of ending the DACA program to an attempt to “unscramble” an egg. Judge Hanen’s ruling was unexpected. In his ruling in 2015 about the program for parents, he made it clear that he thought both efforts to protect undocumented immigrants were illegal. Immigrant rights activists were bracing for a ruling by Judge Hanen against the DACA program. In his ruling on Friday, Judge Hanen made it clear that he thought the DACA program was likely to be declared illegal in the long run. A spokesman for the Justice Department praised the judge for that part of his ruling. “As the Justice Department has consistently argued, DACA is an unlawful attempt to circumvent Congress, and we are pleased the court agreed today,” said Devin O’Malley, the spokesman. But the judge made a distinction between the two programs. He noted that the one aimed at parents, known as Deferred Action for Parents of Americans, had not yet been implemented when conservative attorneys general challenged its legality — a challenge that the judge agreed with. 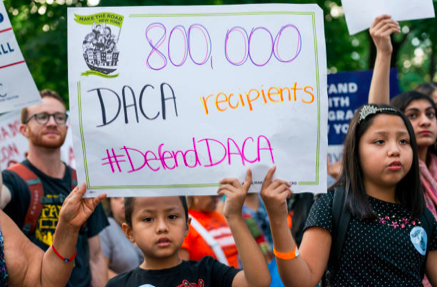 In the case of DACA, however, more than 700,000 young immigrants have come to rely on the program as a way of getting jobs and avoiding the prospect of being sent back to the country of their birth. The judge said that the potential harm to those immigrants was too great to simply end the program. “The reality of the situation is that it conferred lawful presence and numerous other benefits, and many DACA recipients and others nationwide have relied upon it for the last six years,” Judge Hanen wrote. He also added that “DACA is a popular program and one that Congress should consider saving.” Congressional action to come up with a permanent solution for the DACA program has stalled amid bitter recriminations between Mr. Trump and Democrats. The legal fight over the DACA program is not over. Judges in other cases have ordered the Trump administration to keep the program alive while litigation proceeds, though with some limitations. The Trump administration, naturally, has already appealed most of those rulings.